The spectacular finale to the New York Times bestselling trilogy that began with Mr. Mercedes (winner of the Edgar Award) and Finders Keepers In End of Watch, the diabolical Mercedes Killer drives his enemies to suicide, and if Bill Hodges and Holly Gibney don t figure out a way to stop him, they ll be victims themselves. In Room 217 of the Lakes Region Traumatic Brain Injury Clinic, something has awakened. Something evil. Brady Hartsfield, perpetrator of the Mercedes Massacre, where eight people were killed and many more were badly injured, has been in the clinic for five years, in a vegetative state. According to his doctors, anything approaching a complete recovery is unlikely. But behind the drool and stare, Brady is awake, and in possession of deadly new powers that allow him to wreak unimaginable havoc without ever leaving his hospital room. Retired police detective Bill Hodges, the unlikely hero of Mr. Mercedes and Finders Keepers, now runs an investigation agency with his partner, Holly Gibney the woman who delivered the blow to Hartsfield's head that put him on the brain injury ward. When Bill and Holly are called to a suicide scene with ties to the Mercedes Massacre, they find themselves pulled into their most dangerous case yet, one that will put their lives at risk, as well as those of Bill's heroic young friend Jerome Robinson and his teenage sister, Barbara. Brady Hartsfield is back, and planning revenge not just on Hodges and his friends, but on an entire city. 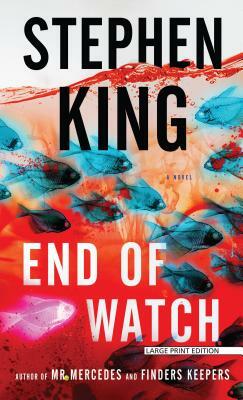 In End of Watch, Stephen King brings the Hodges trilogy to a sublimely terrifying conclusion, combining the detective fiction of Mr. Mercedes and Finders Keepers with the heart-pounding, supernatural suspense that has been his bestselling trademark. The result is an unnerving look at human vulnerability and chilling suspense. No one does it better than King.